I am NOT one of those people who planned to hike the PCT solo. I originally had a hiking partner (hi Adelaide! ), but those plans unfortunately fell through. When that happened, I assumed I just wasn’t going to hike the trail this year. Then I had a period of mourning over a trip that I spent the better part of a year envisioning. I decided to go for it and at least give it a shot. I am intentionally starting the weekend of the official kick off so I will be, “with the herd.” There are a lot of other hikers out there just like me and people tell me I won’t be alone unless I want to be. 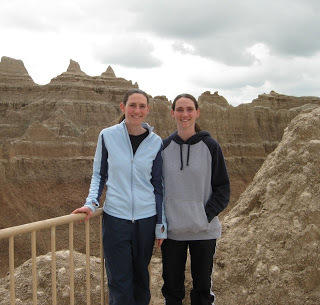 Siobhan (left) and I at Badlands Nat’l Park. For me, the concept of going solo takes on a whole other meaning because I am an identical twin. I can’t imagine what it’s like to be truly solo. There is hardly a moment in life, where I didn’t have a photocopy of myself standing next to me and matching me stride for stride. It wasn’t until recently, when I moved to Portland, that I started thinking and speaking in terms of “I” instead of “we.” It still feels wrong sometimes. When Adelaide first asked me about hiking the trail last year, the first thing I said was, “I can’t. My sister (Siobhan) might be having a baby next summer.” It wasn’t until I saw the look on Adelaide’s face that I realized how crazy it sounds to other people that I can’t plan a trip because my sister, (2000 miles away), might be having a baby. As it turns out, Siobhan will be having her first child just before I finish my hike. I am bummed that I won’t be there and that she won’t be able to come on the trail, but we will be using the phone and Skype to keep in touch. There will be some withdrawal I’m sure, but I’ll try to cut it down to just one phone call a day. As for how this affects my hiking, I find that I don’t want to hike alone, but I tend to get frustrated by the effort it takes to be with people who are not my twin. I’ve always had the luxury of having the perfect compliment to me right next to me. I’m not used to energy that it takes for that extra communication and that wears me out. In daily life, it makes me more content to do things on my own. My gut is to want to do that on the trail, but I know I get freaked out in the wilderness on my own. This will be an interesting balancing act that I will have to figure out along the way. It will definitely be a growing experience! The SPOT Satellite GPS Messenger is a device the size of a beeper that I will be carrying with me. Many hikers use them to let their families know where they are and that they are safe. I have set up a “Where’s Erin” tab at the top of my journal that will take you to a Google Map of where I am on my journey. When I press a check-in button on the SPOT, it uses satellites to determine my GPS location. That information is sent out (via text or email) to up to ten predetermined friends or family members who can view my location on Google Maps. There is also a help button I can press to send a message that I am okay, but need assistance. In an emergency, I can press the SOS button if I am in a life threatening situation. It will then send an alert message to search and rescue who will be able to locate me using the GPS coordinates. This does add an extra 5oz to my pack weight, but the weight is well worth the reassurance that it gives to my friends and family. I want to give a big THANK YOU to Alice and Brian for giving me the SPOT! I know this will be tough to be away during such a time, and while it may sound crazy to some. . . I understand. While I'm not a twin, I am struggling in ever thinking about moving further away from my sister and my niece and nephew. The SPOT is so cool! Can't wait to follow you on the trails. . . Thanks Breana:)Hannah, seeing your twin niece and nephew makes me think about Siobhan everytime. I'm still holding out hope that they will move to Portland someday!